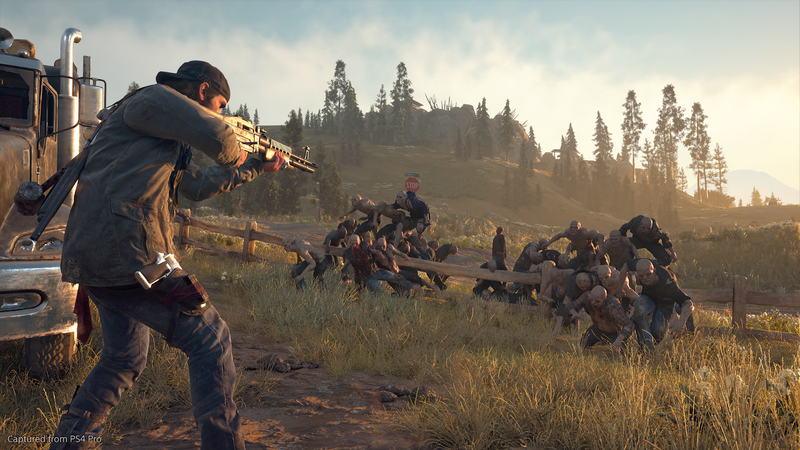 Yesterday, I checked out a handful of upcoming PlayStation games and finally got to play Days Gone. Zombie apocalypses seem a dime a dozen these days, and while the setting and characters felt generic, the teeming zombie hordes are some of the most terrifying I’ve ever faced. Days Gone is an upcoming action-survival game by SIE Bend Studio that hits all the notes you’d expect for the genre. Players control Deacon St. John, a biker roaming the lonesome roads of a zombie-ravaged world. What I’ve seen of Days Gone before now has never drawn me in—how many on the fly crafting systems and snarling zombies have we seen in recent years? But playing Days Gone is genuinely scary. The game throws zombies at the player literally by the hundreds, turning horde disposal into tense, on-the-fly battle puzzles. The first scenario I played kept the stakes small. I snuck into a gas station to look for a fuel pump for Deacon’s bike. While I was given plenty of gear for blasting zombies, I opted for stealth. If you’ve played The Evil Within 2 or The Last of Us, the cadence will be familiar: Find one piece of cover or large bush to hide in, plot your path and move to the next. In Days Gone, this was made more complicated by highly alert enemies who sometimes clashed with each other. Group of “Freakers”—yes, that’s what they’re called—sometimes fought over scraps of food or else shifted their patrols in unexpected ways. Sneaking led to some really gritty situations. I was able to assemble a makeshift silencer for my pistol that made it easy to pop zombies’ skulls. I also had plenty of bloody stealth takedowns. I’ve killed plenty of zombies over my video game career, so it was no sweat. But then Days Gone threw me a manipulative curveball: child zombies. That might sound silly, but it did give me pause. In the moment I hesitated to pull the trigger, they leapt right at me. If nothing else, the contrast between the game’s violence and the expressive, still human-like enemies created an interesting moment, even it did feel a little cheap. In another moment I had access to a high level character and had to clear a huge group of zombies from a junkyard. They piled up in a small ditch, hundreds of bodies stumbling over each other. I attempted to plant bombs in key locations, such as gasoline trucks and narrow paths, in order to thin their numbers. It didn’t really work. The zombies caught sight of me and rushed, ignoring my traps and beelining towards me. If there’s one thing that Days Gone completely nails, it’s the sheer horror of seeing a horde of enemies crash upon you like a wave. I took out some of their numbers, but I was soon swamped by the rest and torn to shreds. Determining the best course of action slowed things down into the type of planning you might expect from a tower defense game. A bomb here, a crafted napalm cocktail to kick things off, a sound contraption to draw them the other way, bursts of machine gun fire to blow up a truck. Making progress was satisfying, but I worry that the difficulty of clearing out large groups—I had a ton of great weapons and gear but still struggled—might lead to trial and error gameplay that frustrates casual players. While the gameplay had plenty of memorable moments, I’m unsure if they will be enough to draw me into its fairly generic world. The demo had tough bikers and self-scarred fanatics but nothing that showed narrative heart. I’m intrigued by the prospect of massive zombie battles and had a good time tackling this demo’s challenges. Hopefully the finished game will have more than the technical achievement of hundreds of enemies.